A driver has admitted killing Olympic cyclist Chris Boardman's mother by running over her after she fell off her bike in Deeside, Flintshire. Carol Boardman, 75, died in July 2016. Liam Rosney, 33, of Connah's Quay, admitted causing death by careless driving at Mold Crown Court. He had previously faced a charge of causing death by dangerous driving. He and his wife Victoria Rosney were cleared of attempting to pervert the course of justice in July. Rosney had been due to stand trial on Monday but changed his plea when proceedings were about to start. He will be sentenced at a later date. Following the change of plea, Matthew Curtis, prosecuting, said the Crown had carefully considered the position and did not invite a trial in relation to the more serious charge of causing death by dangerous driving. Mrs Boardman, a keen cyclist, died after she fell off her bike and Rosney drove over her at a roundabout on 16 July 2016. She had been a competitive cyclist in her youth and had remained active in cycling to the last. 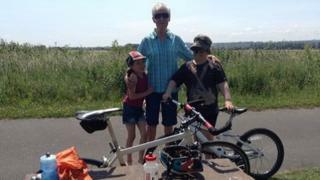 Chris Boardman said in a tribute Mrs Boardman had "never lost her love of the bike or competing". Are marathons bad for the environment?